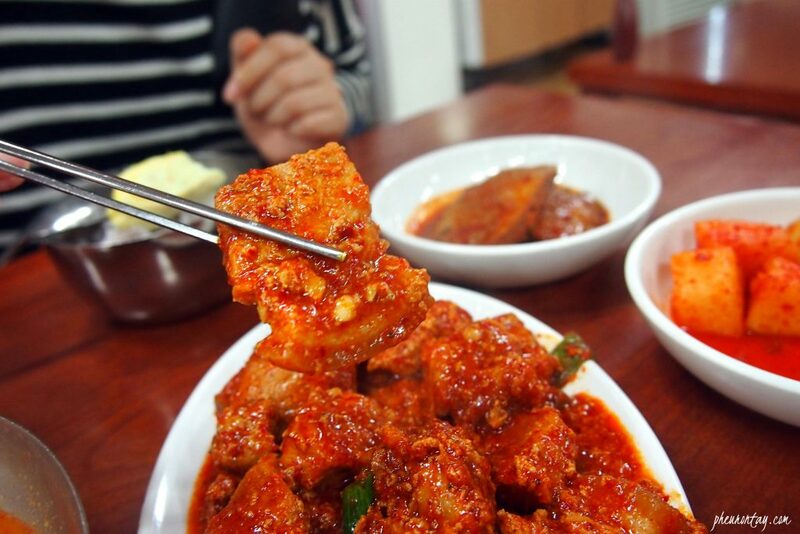 Kimchi Jjigae (김치 찌개), or kimchi soup is a Korean stew made of fermented kimchi, pork and tofu. 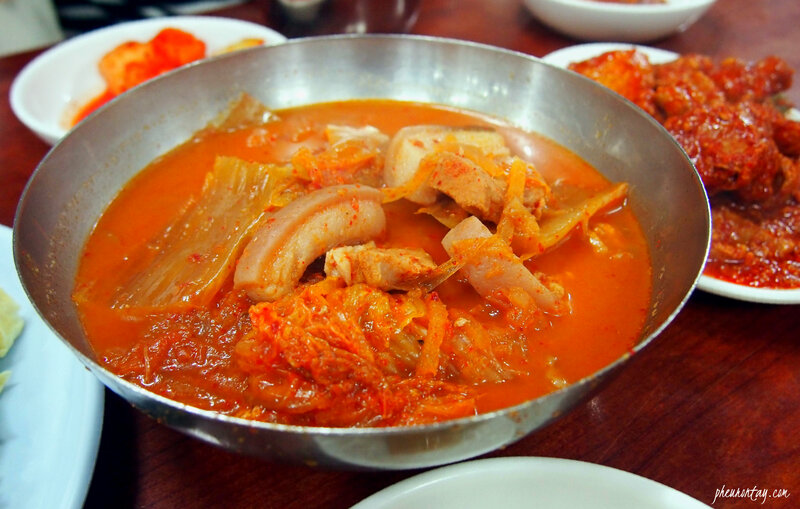 Each Korean household has their very own versions of Kimchi Jjigae and it is considered a staple dish in the country. While most of the households secretly hold their house kimchi in high regard, it is uncommon a foreigner gets an invitation to a Korean’s house for a home cooked Kimchi Jjigae. That said, you can easily get a bowl of this spicy-sweet, utterly Korean comfort food here at Guldari Sikdang 굴다리식당 [read: gool-da-ri seek-daang] one of the Top-3-Kimchi-Jjigae restaurants in Seoul. If you’re planning your Seoul trip itinerary and want something original and typical but less touristy, this restaurant is an excellent option. It is located near the Gongdeok AREX Station 공항철도 공덕역, which is a great location for you to get your very first meal upon arrival, or a wonderful last meal in Korea. Trust me, you probably won’t stop yearning for the soup until your next trip here. A set of kimchi jjigae cost KRW 7,000 and comes with rice and assorted side dishes. Now, ATTENTION, my fellow BIG eaters! Here at Guldari Sikdang, you can ask for both the rice AND the kimchi jjigae refill if you order the amount of food according to the number of the headcounts you have. There is no limit on free refills. 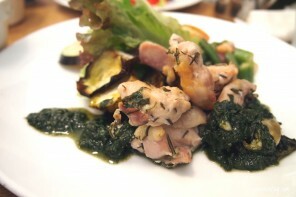 It is really eat-all-you-can at KRW 7,000. Deal? Pardon me, I only managed to take a few general shots of the food as I was too hungry that day. Moreover, I was with two other friends who were as hungry as I was. When you have (h)angry friends it wouldn’t be nice to make them wait. LOLx. However, I managed to find some very nice photos taken by a Korean blogger the Nomad21, you can check out other pictures of the restaurant here. So here’s our Kimchi Jjigae from Guldari Sikdang. The soup hits a beautiful sweet and sour balance. I would say it is a clever 6:4 sweet and sour ratio, with a little spicy kick at the end — a result achieved by cooking a huge amount of old, over-fermented kimchi over a long time. The soup gets thicker and tastier as more time is invested to simmer the soup. The outcome is a mouth-watering broth in a tempting shade of orange-red, with deep flavours and taste. Each and every leaf of the kimchi is cooked to a soft, semi-translucent state, fully sucking up the appetising broth. Mix your rice with some kimchi soup and dried seaweed — this might not be an elegant sight, but you’ll find yourself with an empty rice bowl in no time. Korean call dishes like this the “rice thief” (Bap-doduk 밥도둑). As you gobble up this messy little bowl, the show has just begun. No more rice in your bowl? Time to shout: “Yi-mo~ bap hana chu-se-yo” and get your silver rice bowl refilled before we move on to the next dish. The other menu in the restaurant is Jaeyuk Bokgeum (Spicy Stir Fried Pork 제육볶음). 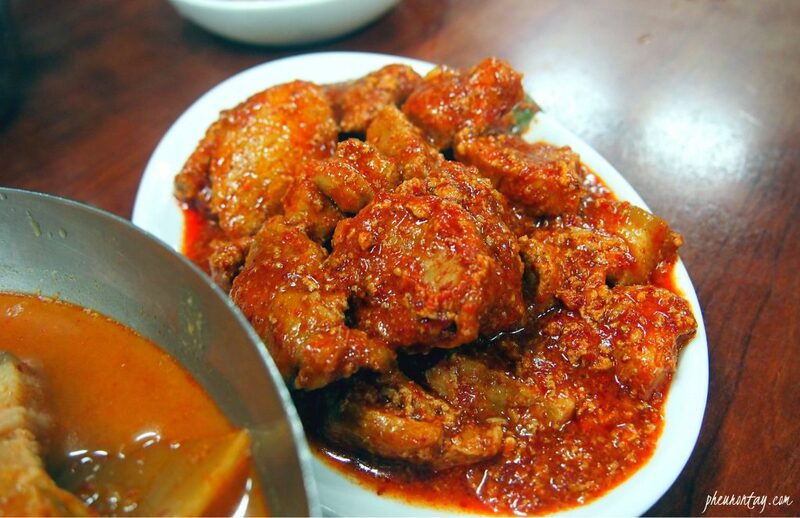 Going at KRW10,000 per serving, these thick chunks of pork are soft, spicy and very well marinated. It is not exactly cheap but I find them filling enough. I liked it because there wasn’t a single trace of the funky pork-y smell in the dish. Contrasting with the others who serve their Jaeyuk Bokgeum using thinly sliced pork, Guldari’s juicy and tender meat is boldly and generously cut into huge chunks. 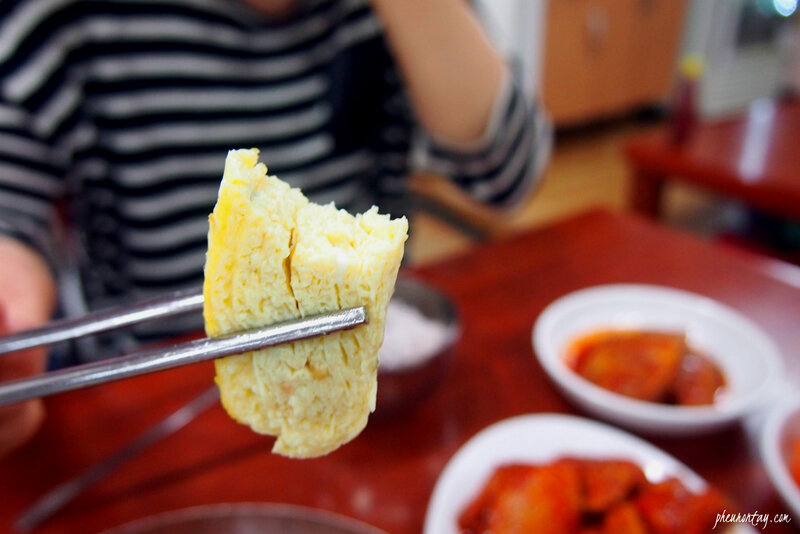 Koreans would tell you the Jaeyuk Bokgeum chunks reminds them of their grandma’s cooking. It is a dish that evokes a sense of nostalgia to many Koreans. The garlic-y spicy gravy is the highlight of the meal. I have no idea what exactly they do to the red Yangnyeom gravy but it was downright delicious. Please be sure to scoop a generous portion of the gravy onto the rice, and have some seaweed ready for wrapping. 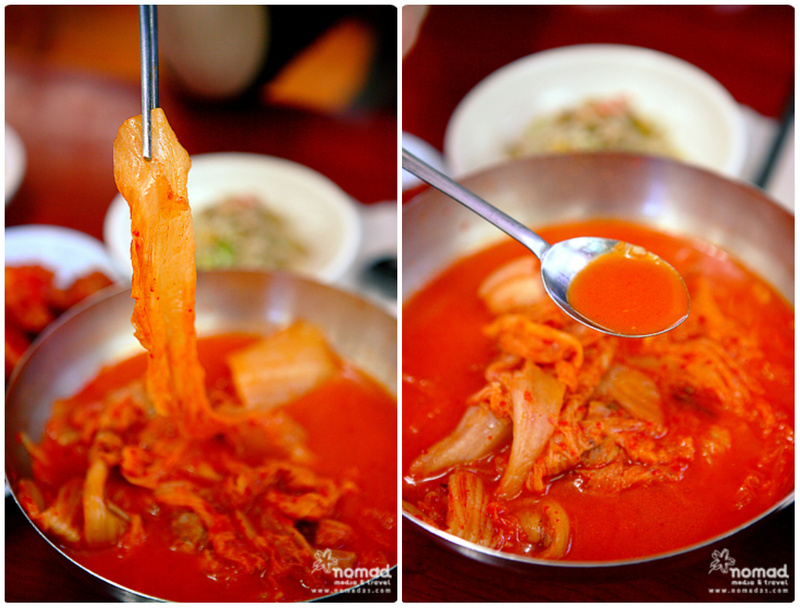 Another star side dish is this thick Gyeran Mari (계란말이). 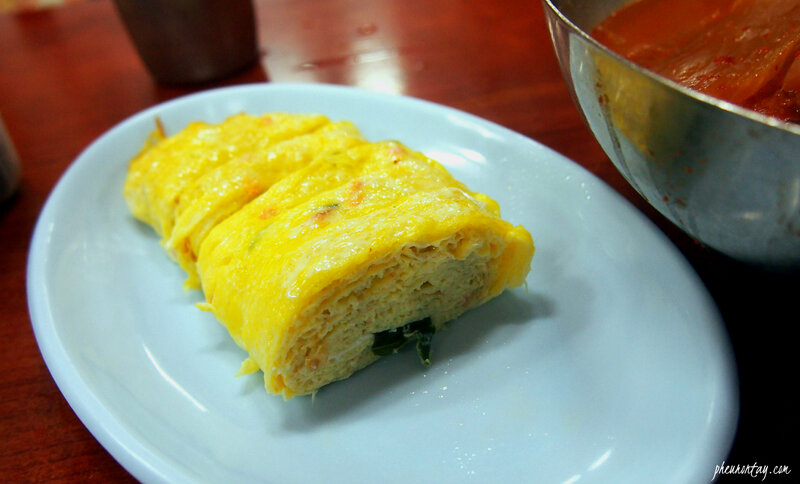 This Korean rolled omelette is a popular Korean side dish, usually appear in lunch boxes. It is so humble yet satisfying; I couldn’t imagine having Guldari’s kimchi soup and Jaeyuk Bokggeum without having their rolled omelette. A meal at Guldari is incomplete without the Gyeran Mari. Do you get me? LOLx. You don’t need to order this as they serve it as sides throughout the year. It is refillable too! Looking at these Guldari foodporn by Korean Instagrammers make me droll. 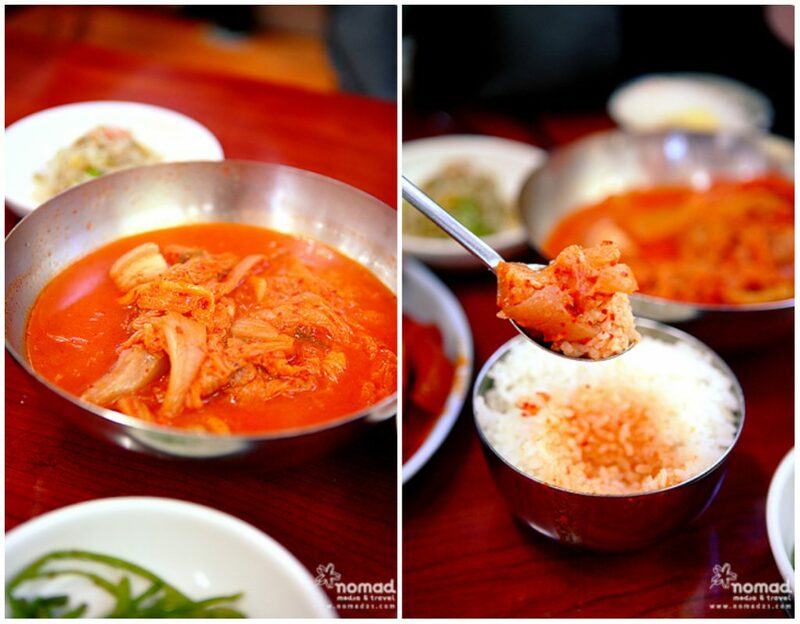 I would brave the snow and get my kimchi jjigae crave satisfied now! #공덕#굴다리식당#김치찌개 신김치에 지우개만힌 고기랑 밥한공기 뚝딱ㅎ 이틀남았다. 함께해줘서 너무 고마워?